This spring, UNCW’s Center for Education in Science, Technology, Engineering and Mathematics (CESTEM) will again host two popular STEM events for area students. 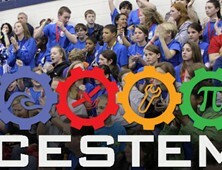 The Southeast Regional Science and Engineering Fair will be held from 8 a.m. to 3 p.m. Feb. 7 in Hanover Gymnasium. The event features 200 students in grades 3-12 from schools in 13 surrounding counties. For more information, visitwww.uncw.edu/cestem/sciencefair.html. The Wilmington Regional Science Olympiad will be held at UNCW on March 7. Middle and high school teams from Brunswick, New Hanover, Pender and surrounding counties will showcase their work at the annual regional competition, and top finishers will go on to compete for state honors in Raleigh. Last year’s event drew a record 851 participants. For more information, visitwww.uncw.edu/cestem/ncso.html.